Micromax Canvas Doodle 2 will be the company’s next flagship android smartphone . Lots of devices nowadays gets leaks before the official launch . iphone 5S & iphone 5C , Amazon next generation Kindle Fire HD 2013 & Samsung Galaxy gear smart watch are most awaited devices , to be launched on Spetember . But all these devices & there respective companies are getting huge hype . 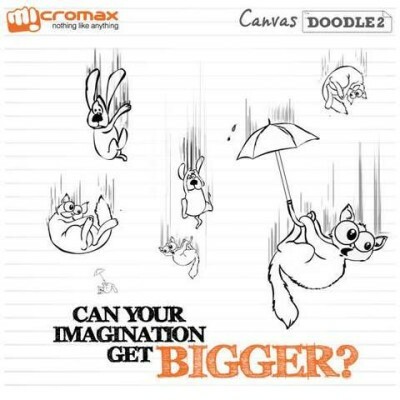 It seems that now Micromax has also started hyping there upcoming Android smartphone ” Canvas Doodle2 ” . It will be the upgraded version of Micromax A11 canvas Doodle that arrives before some months back . Micromax had not got good response from its last A210 canvas 4 . Because peoples are expecting much more from the company . Micromax has not disclosed any sort of information about Specifications & features of the device . The company is hyping the device by saying that it will come with bigger screen , would be of 6 inches . No doubt , a capacitive pen or stylus will be offered with the Micromax Doodle 2 to delight the customers and there business as well . The company will try to put its best this time and will try to please the peoples at any cost . The company’s Facebook page is hyping the device in there own sweet way . 8 or 13 MP rear auto-focus camera along with LED flash . 1GB or more RAM . Full HD 1080p display or at least 720p . 1.5GHZ Quad core processor . Better stylus / capacitive pen . Price under RS 15,000 . According to us Micromax will launch it in the month of September as most of the brands are doing . If Micromax Canvas Doodle 2 comes with above specs & will be prices under Rs 15000 then it would be a great deal to own it .